The prosecution believes that Saud al-Qahtani and General Ahmed al-Asiri, who were removed from their positions in October, were among the planners of the killing. 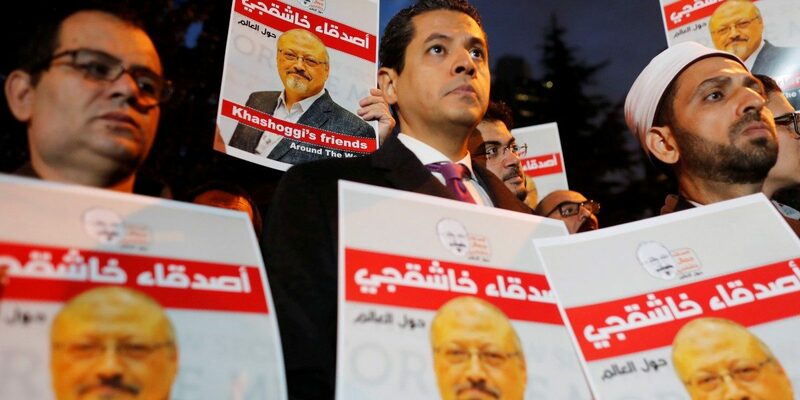 Demonstrators hold posters with picture of Saudi journalist Jamal Khashoggi outside the Saudi Arabia consulate in Istanbul, Turkey October 25, 2018. Credit: REUTERS/Osman Orsal/File Photo. Ankara: Istanbul’s chief prosecutor has filed warrants for the arrest of a top aide to Saudi Arabia’s de facto ruler and the deputy head of foreign intelligence on suspicion of planning the killing of Jamal Khashoggi, two Turkish officials said on Wednesday. The prosecutor’s office has concluded there is “strong suspicion” that Saud al-Qahtani and General Ahmed al-Asiri, who were removed from their positions in October, were among the planners of the October 2 killing at the Saudi consulate in Istanbul, the officials said.